Climate change mitigation and sustainable practices are now at the top of political and technical agendas. Environmental system modelling provides a way of appraising options and this book will make a significant contribution to the uptake of such systems. It provides knowledge of the principles involved in modelling systems, builds confidence amongst designers and offers a broad perspective of the potential of these new technologies. 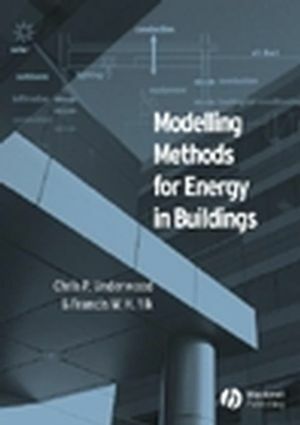 The aim of the book is to provide an understanding of the concepts and principles behind predictive modelling methods; review progress in the development of the modelling software available; and explore modelling in building design through international case studies based on real design problems. Chris Underwood is Reader in Building Services Engineering at the University of Northumbria and Francis Yik is Professor of Building Engineering at the Hong Kong Polytechnic University. Both have extensive experience of the development and application of modeling to energy and fluid flow problems in buildings and have published widely on subjects ranging from ‘smart’ control of building systems to wind flow around high-rise buildings. Chapter 1 Heat Transfer in Building Elements. 1.1 Heat and mass transfer processes in buildings. 1.2 Heat transfer through external walls and roofs. 1.3 Analytical methods for solving the one-dimensional transient heat conduction equation. 1.5 Heat transfer through glazing. Chapter 2 Modelling Heat Transfer in Building Envelopes. 2.1 Finite Difference Method – A Numerical Method for Solving the Heat Conduction Equation. 2.2 Heat Transfer in Building Spaces. 2.3 Synthesis of Heat Transfer Methods. 2.4 Latent Loads and Room Moisture Content Balance. Chapter 3 Mass Transfer, Air Movement and Ventilation. Chapter 4 Steady-State Plant Modelling. 4.1 Model Formulations for Plant. 4.2 Mathematical Models of Air-conditioning Equipment using Equation-fitting. 4.3 A Detailed Steady-state Cooling and Dehumidifying Coil Model. Chapter 5 Modelling Control Systems. Chapter 6 Modeling in Practice I. 6.2 Internal Ventilation Problems6.3 Wind Flow Around Buildings. 6.5 Applications to Control and Fault Detection. Chapter 7 Modeling in Practice II. 7.2 Tools and Their Integration.